EmblA is the Nordic center of excellence within ensemble-based data assimilation. The center includes several world-leading experts within the development and application of ensemble data assimilation, and supports Nordic users of data-assimilation methods with instruction and training, state-of-the-art open-source data-assimilation codes, and works within R&D of data-assimilation methods in a number of applications. EmblA also conducts fundamental research at the forefront of the methodological development of ensemble-based data assimilation. The Annual EnKF workshop arranged in Bergen in collaboration between NERSC and IRIS (see www.iris.no/enkf/enkf-homepage). The bi-annual international summer school arranged by Prof. Remus Hanea in Romania (http://data-assimilation.com/aboutus). The center also organizes an introductory 1-week school in ensemble-based data assimilation for students in the Nordic countries and beyond and in addition hosts visiting scientists from Nordic countries as well as international collaborators. A number of additional partnerships have been formed with institutes in need of data-assimilation expertise. Thus, the EmblA-center vision is to function as the central hub for ensemble-based data assimilation in the Nordic countries and one of the leading point worldwide. 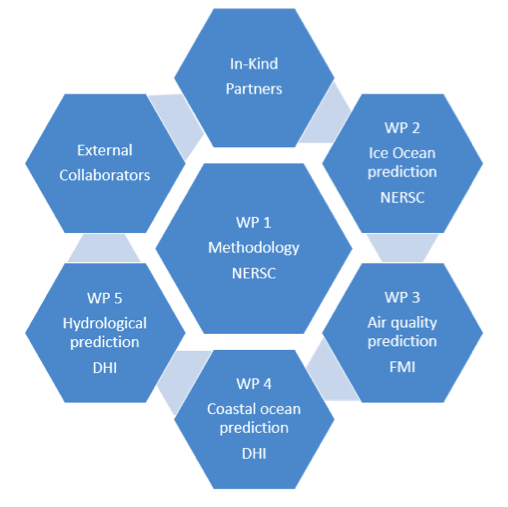 The structure of the center is illustrated in Figure 1, where NERSC and WP 1 is the methodological data assimilation component that serves as a common point of interaction and collaboration for all axes in the center. Each axis corresponds to a work package, focusing on a particular application, where a corresponding center participant has the responsibility. In the center we can differentiate between the partners and WPs directly funded by EmblA and the additional partners and their applications that have later linked up to and interact with the center. Interactions between partners can either go to the central (methodological) part or from one application to another. Which data assimilation method to use? How to handle practically the theoretical issues? How to handle uncertainties? From September 2017 to December 2017, data assimilation courses are given to the students at Master and PhD levels of University of Bergen as of the MAT330 classes of the Institute of Mathematics. The lecturers are Geir Evensen, Laurent Bertino, Alberto Carrassi and Patrick Raanes. The course lasts 44hrs, gives 10 credits, and is hosted at NERSC premises. This is now a big tradition. Every second year, Remus Hanea brings a good sample of the top of the cream of data assimilation to a fantastic place in Romania for a 2-weeks summer school. After fantastic places like Iasi, Brasov, Cluj, we are back to Sibiu.